This useful book is filled with ideas and projects that are fun to make! The author, a professional artist, has drawn the instructions for the items and the skills he is demonstrating, making a book that can be easily utilized by people of many age and ability levels. There's valuable information her for the hobbiests, Boy Scouts, survival enthusiasts, family campers -- for anyone who enjoys outdoor life! The author know what information is needed and presents it concisely -- things like suppliers' addresses, how to set traps without mashing a thumb, what clothing is most comfortable and durable, and the aspects of black powder safety. 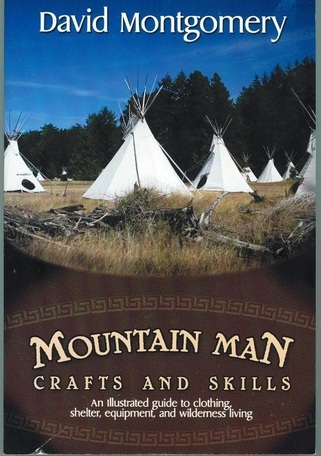 he even provides an extensive glossary, an annotated bibliography, and suggestions for teaching mountain man crafts as a secondary school course. This book is rich in mountain man historical lore too, describing foods and living habits, and even sharing some favorite yarns! This book is a must for everyone who loves outdoor life and for all those who enjoy working with their hands. Paperback, c2006, 239 p. : ill. ; 15 cm.